San Jose, CA – April 12, 2018 – NeuVector, the leader in Kubernetes security delivering the first and only multi-vector container firewall, today announced NeuVector 2.0. The enhanced security solution further protects Kubernetes environments by building on the unique NeuVector run-time security automation, which combines east-west traffic visibility with container process monitoring and vulnerability scanning. NeuVector 2.0 adds important new capabilities that include a Kubernetes incident response system alongside advanced process and file system protections to secure against new attack vectors. NeuVector 2.0 will be available for demo at RSA Conference 2018 in San Francisco, April 16-20 (booth #4910). Enterprises require fast and decisive responses when security incidents and potential attacks occur within Kubernetes deployments. NeuVector 2.0 deploys within an organization’s existing security processes to rapidly address and mitigate ongoing container threats. When NeuVector detects threats and vulnerabilities, the new auto-response rules – built to address common container attacks and security alerts – instantly provide response actions to protect containers and generate alerts. These rules can also be customized to match criteria such as specific container vulnerability profiles, or set to address suspicious activity across multiple threat vectors – including the container network, processes, or file system. NeuVector 2.0 provides a unique range of incident responses, with full capabilities to quarantine compromised containers, generate custom notifications, and whitelist non-critical events. Using NeuVector 2.0, enterprises can fully address container security events and protect their applications, container services, and infrastructure from multi-vector attacks. NeuVector 2.0 also adds new automated protections that detect exploits within containers, such as suspicious processes or file system activities. The security solution automatically calculates a baseline of container processes, whitelists legitimate activity, and alerts on any deviation from the baseline. Any installation of malicious packages, libraries, or new executables – or any modification to sensitive files – triggers NeuVector to scan the container for vulnerabilities and alert on the suspicious activity. These automatic protections do not require configuration but do allow for easy customization of whitelist/blacklist rules as desired. 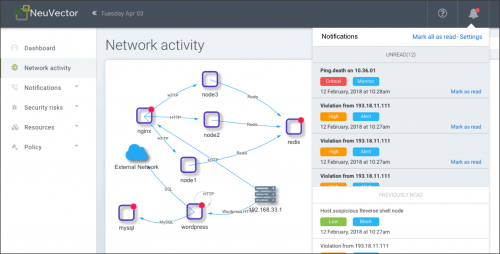 The new capabilities bolster NeuVector’s multi-vector firewall by adding deeper insights into activities within Kubernetes deployments, further safeguarding containers from process and file system attack vectors.